The Canadian PM has long ducked invitations to directly criticize Trump. Justin Trudeau never asked to be anointed the "anti-Trump." After his first face-to-face meeting with the U.S. president in Washington Monday, Canada’s prime minister made it clear that he won’t be the one to pick up that mantle. But those eager to read between the lines are, it seems, invited to keep reading. The contrasts were easy and obvious long before the bellicose billionaire won the Republican nomination and then improbably took the White House. Donald Trump ran a movement many saw as demonizing Muslims and immigrants, and was accused of mistreating women. Meanwhile, somewhere up north, Trudeau won international acclaim as the sunny feminist who greeted Syrian refugees one cold night in Toronto. When former U.S. vice-president Joe Biden visited Ottawa shortly after Trump’s victory, he told Trudeau the world would soon spend a lot of time looking to him. It felt for some like Canada was having a moment. But those following along know Trudeau has long ducked invitations to directly criticize Trump, even after the controversial executive order banning travellers from seven Muslim-majority countries. On Monday, in careful, measured words, Trudeau suggested his stance won’t change. "There have been times where we have differed in our approaches and that has always been done firmly and respectfully," Trudeau said when asked to comment on Trump’s executive order, now being challenged in court. "The last thing Canadians expect is for me to come down and lecture another country on how they choose to govern themselves. My role, our responsibility, is to continue to govern in such a way that reflects Canadians’ approach and be a positive example in the world." Trump defended the policy as "common sense." Trudeau said that he and his counterpart share common goals. "Both President Trump and I got elected on commitments to support the middle class, to work hard for people who need a real shot at success," Trudeau said. "We know that by working together, by ensuring the continued effective integration of our two economies, we are going to be creating great opportunities for middle class Canadians and Americans, now and well into the future." "The last thing Canadians expect is for me to come down and lecture another country on how they choose to govern themselves." It was, perhaps, a perfectly reasonable approach for a prime minister responsible for keeping almost US$2 billion in trade flowing across the border each day. Trump aims to reopen the North American Free Trade Agreement and the words that define his presidency so far — "America First" — can be startling for millions of Canadians who depend on a strong U.S. for their livelihood. Trudeau leaves Washington with a public commitment from Trump that he will co-ordinate closely to protect jobs, promote trade, and "keep wealth on our continent." While many will interpret that as a win or even a model for other leaders who must likewise deal with Trump, those who hoped for more might be slow to celebrate. Just before the press conference, the daughter of former Canadian prime minister Joe Clark tweeted that she hoped Trudeau might go full "Love Actually," if things went sideways. It’s a reference to the scene in the movie when Hugh Grant as the British prime minister, charmingly and forcefully knocks the U.S. president down a peg in front of the cameras. It’s the kind of stuff of which Canadians (and Brits and Aussies and maybe others) sometimes dream. Real life is trickier. As he has been celebrated elsewhere, Trudeau has also faced some pressure at home from those who want him to be bolder. The outgoing leader of the left-wing New Democratic Party, who recently called Trump a “fascist” in the House of Commons, has accused Trudeau of staying quiet in the face of Trump’s "Muslim ban." "It is always the role of a Canadian prime minister to stand up to racism and hatred,” Tom Mulcair recently lectured Trudeau in front of his colleagues. Up until now, Trudeau’s strategy seemed to be one of sub-tweets. When women marched in the streets the day after Trump’s inauguration, Trudeau took to Twitter to laud Canadian protesters as inspirations. While some U.S. media outlets pounced on it as another reason to move to Canada, it was later pointed out that no Liberal ministers, not even the one responsible for the Status of Women, participated that weekend. In the wake of Trump’s executive order, Trudeau tweeted that those fleeing persecution and violence would be welcome in Canada. The message was interpreted by international media as a sign that Canada would take in those now turned away from the United States. While incredibly popular, the tweet was not followed with changes in Canada’s refugee policy. All along, Trudeau has maintained he would be able to work with Trump, despite their obvious differences. That work began in earnest Monday with a handshake outside the White House. Trudeau led with his right hand and placed his left firmly on Trump’s shoulder. Maybe it was an act of warmth, maybe it was an attempt to prevent the president from jerking his arm forward, as Trump is wont to do. Trudeau has a firm handshake. One imagines he might have learned it from his father Pierre Elliott Trudeau, a former prime minister. 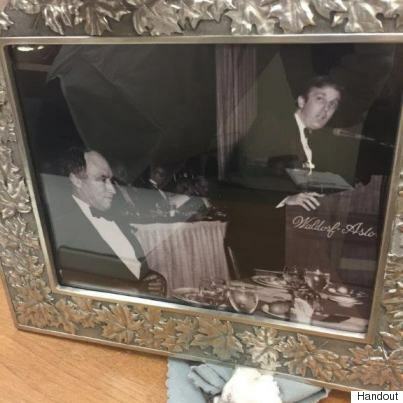 Trudeau gave Trump a framed photo of the president and his dad at an event in 1981, perhaps another reminder of things they share in common. The elder Trudeau, whose legacy looms large over the prime minister, once famously said that living next to the U.S. was a lot like sleeping with an elephant. “No matter how friendly and even-tempered is the beast … one is affected by every twitch and grunt,” he said. The world shouldn’t look to Trudeau to deliberately poke.